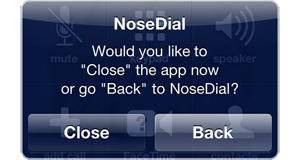 Why was NoseDial made and how do you use the app? The iPhone's touchscreen cannot be used when wearing gloves. Any time you're outside in the cold and want to call a friend, you have to take off your gloves and freeze. Start NoseDial, BEFORE you put on your gloves. to navigate through your previously added contacts. 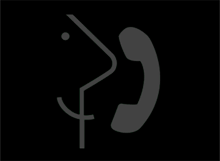 And since you can determine the dialing button size in NoseDial, they are always large enough for you to select the right friend when dialing with your nose. NoseDial goes into the NoseDial standby mode instead of the iPhone standby mode. You can return to the app by double clicking the screen (with your nose). You can go directly to NoseDial standby mode by tilting the iPhone 90 degrees. 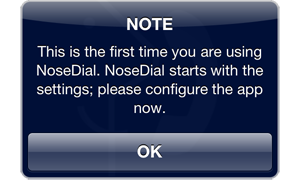 The first time you open NoseDial the app will automatically open the settings. 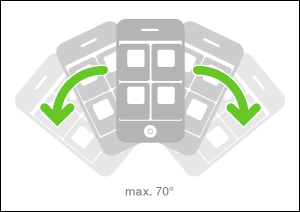 If you open an app and do not use the touchscreen for a longer period of time, the iPhone will enter standby mode. To return to the app you must first "unlock" the phone using the slide bar. 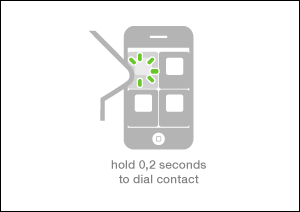 This can be tricky to do with your nose, which is why NoseDial circumvents the automatic iPhone lock and enters NoseDial standby mode after periods of inactivity. 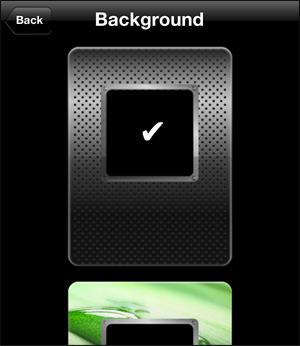 If you do not want this to happen you can re-activate the automatic iPhone lock here. This determines how many dialing buttons will be displayed on the screen, which of course, also determines how large the dialing buttons will be displayed. It's best to start as a "Beginner." 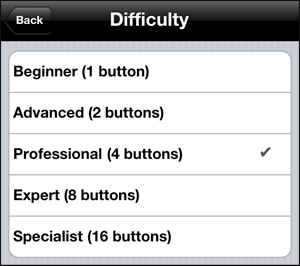 You can choose the appearance for your dialing buttons. Various designs are available. 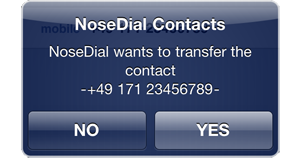 Here you can determine the criteria for displaying your contacts (sorted from A-Z) in NoseDial. to navigate through your previously added contacts. 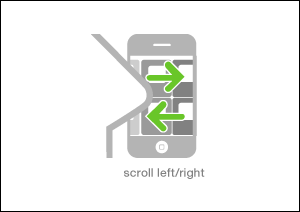 If the tilt mode autoscroll is also activated, you will automatically scroll through your contacts until the iPhone is returned to the upright position. 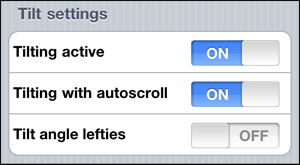 Activate "Tilt angle lefties" if you use your left hand with your iPhone. 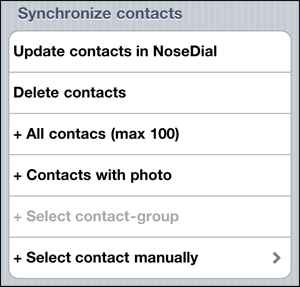 You must first add contacts to NoseDial in order to use those contacts in NoseDial. You can theoretically add as many contacts as you wish. Just remember that you will have to scroll through all your contacts when you want to call a friend. 10-50 contacts is the ideal number to add. 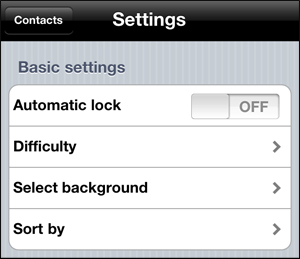 To make adding contacts easier, you can also add "all contacts (max 100)", "all contacts with photo", or "select contact-group" (this function is only active if you use groups on your iPhone). 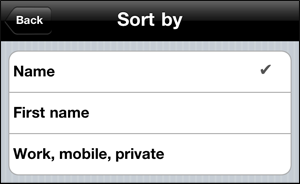 Normally, however, you will "select contact manually" – and this is done similarly as when adding iPhone favorites. 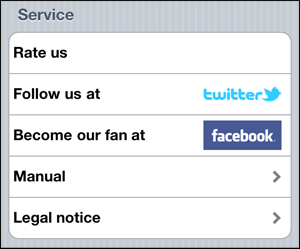 The app will ask you if you wish to transfer a contact when you have selected a contact's telephone number. You can use the function "delete contacts" under settings. This will delete all contacts from NoseDial. If you wish to delete individual contacts, just click a dialing button for approx. 3 seconds. 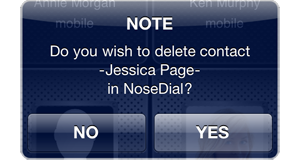 A message will appear asking if you want to delete the contact from NoseDial. 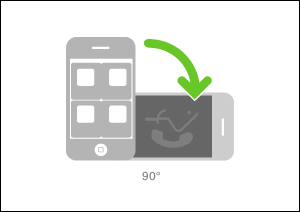 If, for example, you change a number or add a picture to a contact in your iPhone, these changes will not automatically be applied to NoseDial. All you have to do to make these changes is click "Update contacts in NoseDial." 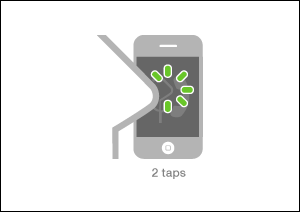 A loading bar will show you when the app is finished synchronizing. This can be completed very quickly when only a small number of contacts are affected and you may not even see the loading bar. Please give us a positive rating in the AppStore and show us how good you are at using your iPhone with your nose on Facebook. We're looking forward to receiving videos and pictures!